WILLIAM AND JOHN. Ship which carried settlers to the island in 1625. The Dutch were calling already before 1625 at Barbados and via sources from the Dutch West India Company in Zeeland the Anglo-Dutch merchant William Courteen sent two ships to Barbados. One of the ships was the WILLIAM AND JOHN or some sources given JOHN AND WILLIAM. 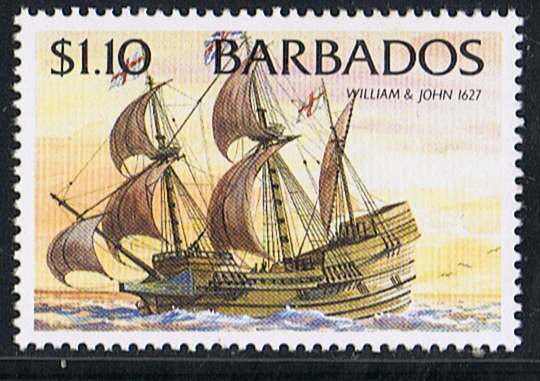 There is not any information on the ship, and the stamp design on the 1994 stamp depicts her “with a certain amount of Licence”. When the Dutch were under Spanish control salt could easily be obtained in Spain and Portugal, but when the ties were broken between the two countries on the end of the 16th century, other sources for salt were needed. The Dutch found it at Punta del Araya on the coast of Venezuela. When in 1621 the Dutch West India Company (WIC) was formed, the outward cargo for these ships to the Caribbean and South America was all kind of merchandise while the homeward cargo was many times salt. Around 1623 around 800 Dutch vessels were used in the trade from the Zeven Provincien to the Caribbean. 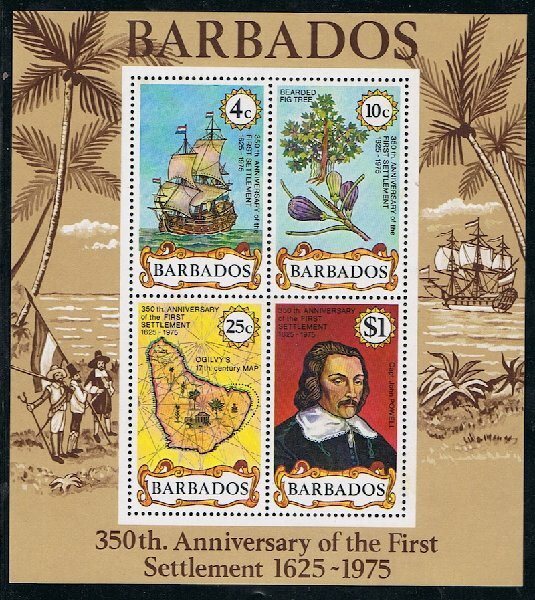 In 1625 the British Captain John Powel visited Barbados, and he took possession of the Island for England. When he returned in the U.K. his employer William Courteen decided to send out British settlers to Barbados. 80 Settlers under the leadership of Henry Powel a brother of John left England on board two ships of which one was the WILLIAM AND JOHN. 20 February 1627 they arrived on the west coast of Barbados, were the settlers landed they named the place Jamestown after King James. They brought with them 10 black slaves captured on the outward voyage from a Portuguese ship, and also all the equipment needed to begin a new colony. Barbados 1975 4c sg538, scott?. 1994 $1.10 sg1086, scott883. Source; Various web-sites. The Caribbean People by Lennox Honeychurch.